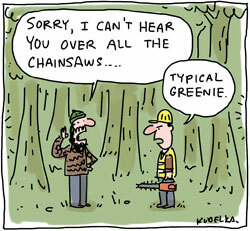 If a tree falls in a forest can you hear it over the chainsaws? It seems The Wilderness Society has finally worked out that “peace in Tasmania’s forests” is code for taxpayers propping up the forestry industry (again) so that it can be business as usual with the added bonus of the pulp mill. The only real surprise is that it’s taken them this long. Looks like the state and federal governments are going to actually have to do their jobs and try and sort something out, which on their respective track records does not look terribly promising.